Spain is such a fun country to travel to, and rich with culture! We loved our time in Madrid and Barcelona, but wanted to visit more. After 5 months since our last visit we came back, this time traveling through Southern Spain to Seville, Córdoba and Granada. You’ll appreciate our advice when I tell you that a Spain travel itinerary isn’t complete without these three cities. The way we planned it was to stay in Seville for a little over a week and spend a day in Granada and then a day in Córdoba. The rest of the time we spent exploring Seville and also putting in time to work. This is what worked for our schedule, but I recommend you to bus from place to place spending a couple days in each city. Since we had to go back and forth from Seville to each city and only had a day to sightsee for Córdoba and Granada we found that the best way was to rent a car. The bus from Seville to Córdoba is an easy 1.5 to 2 hours drive, but to Granada was 3 to 3.5 hours. Renting a car ended up costing us less than what bus tickets would have cost to both Córdoba and Granada. As always, it also allowed us our freedom of how long we wanted to be somewhere and the stops along the way so it was a no-brainer choice to rent a car. 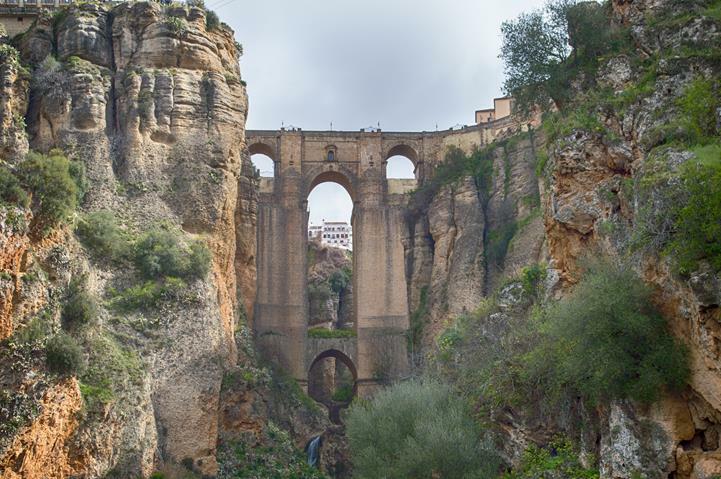 Puente Nuevo, the largest bridge in the City, Ronda. This is one of the sites along the way that we enjoyed hiking to. We could have spent another couple of hours in this cute, little city. Driving through this city was intimidating, even for very experienced drivers with a small car, and we ended up scratching the side mirror in the ridiculously narrow streets. After being pushed out of the city by the flow of traffic we found a parking spot at the top of the city and decided to take it all on foot. Let me just tell you, this is a beautiful city! I’m so glad we had to start and end from the top of it because it gave us an amazing view. 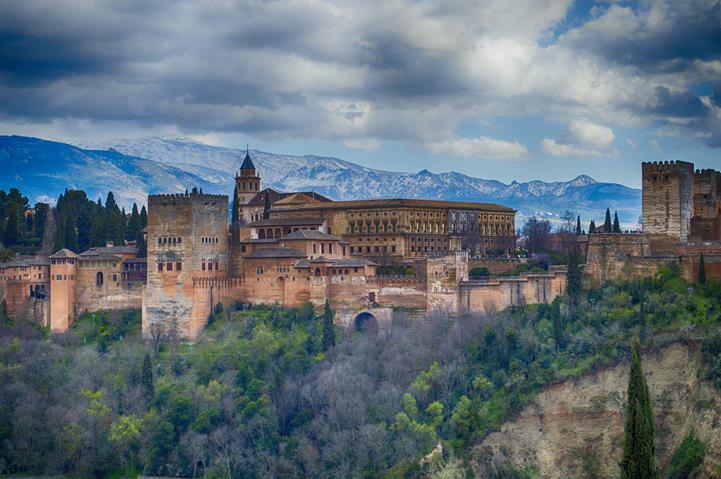 The top tourist spots to see in Granada are the Alhambra Fortress and the Palacio de Generalife. These spots are beautiful and have Arabic style architecture. You have to plan ahead, tickets are best reserved online ahead of time and go early in the day. We also walked to the beautiful Royal Chapel of Granada and Granada Cathedral. We got lost in the streets listening to the Spanish music played by street vendors while we ate our empanadas. Pablo specifically wanted to visit Córdoba because he served a LDS mission in Cordoba, Argentina and wanted to pay homage to it’s mother country. He also saw beautiful sites to visit in Córdoba when he looked it up. Our favorite spots here were the Roman bridge, Mosque of Córdoba and Calleja de las Flores. 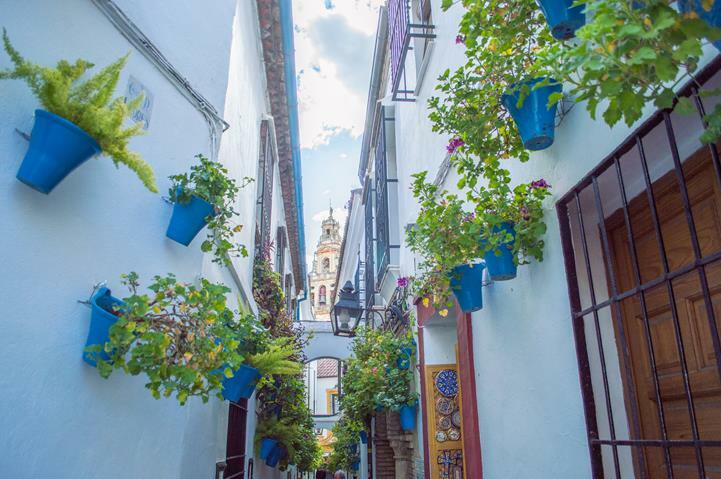 Again, we winded through the streets and found the blossoming flower street, or Calleja de las Flores. The best thing about wandering the streets is that we would find plazas just open out of nowhere into a grand area or structure like the San Pedro Basilica. 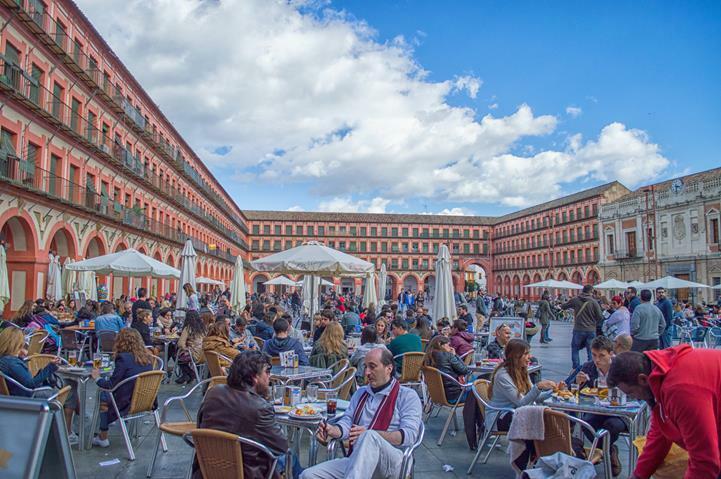 We saw the tapa bars and people sitting out on a sunny Sunday drinking their cafes at the beautiful Plaza del Potro. We could’ve wandered these streets for days. Out of the three cities we chose to stay in Seville because we thought it would have the most to offer. It was a bigger city, and the sites were more spread out, but it would have been easiest to be in Gibraltar since it’s between Seville and Cordoba making the transport shorter to both. It ended up working out because we have more fun when we have our own car, but just a recommendation for when you plan your itinerary. 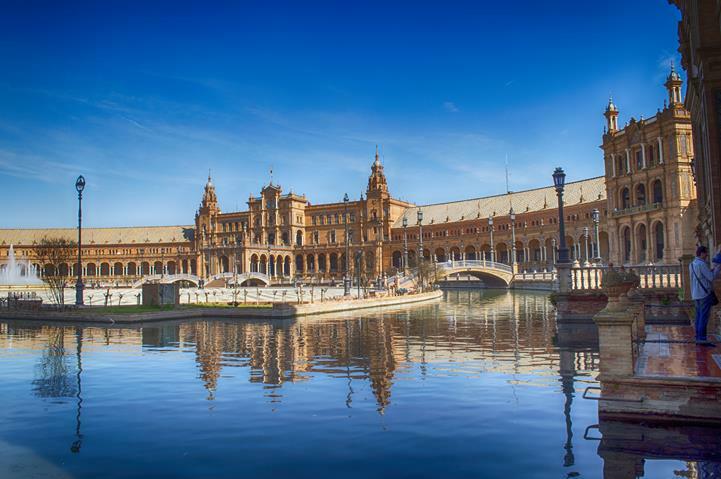 Our favorite spots were the Plaza de España and the Seville Cathedral. Also, make sure to see the Palace of the Countess of Lebrija and the Royal Alcázar of Seville as well (tickets required)! If you couldn’t tell by now, the theme of our sightseeing in Southern Spain was taking it easy and just walking the streets. The culture and atmosphere cannot be missed in these cities. Once we were back in Spain my mouth instantly watered over every passing thought of churros con chocolate and I knew I had to satiate my craving. 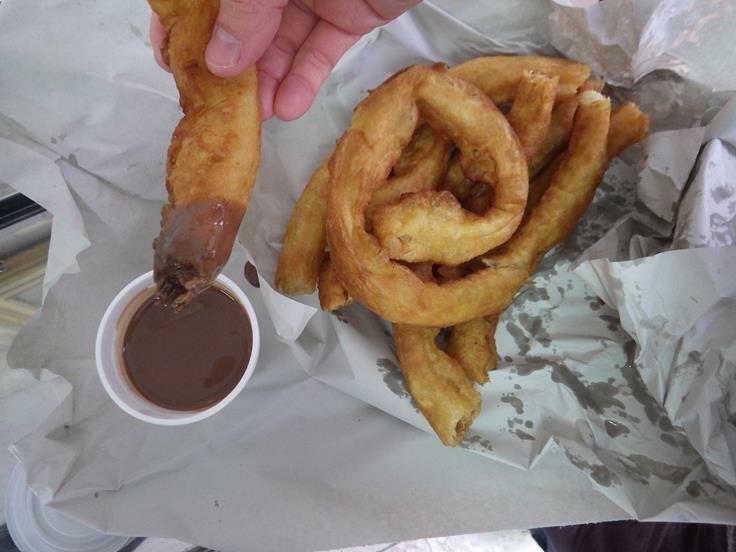 Not only did we find churros con chocolate, but the guy who made them was a pro. His shop was set up for specifically churros con chocolate and rotisserie chickens. How on earth did he know that those were two of my favorite things to eat?! We should just move right next door to him, but better for my health that we don’t. The orange trees in Southern Spain were in full bloom and we were wondering how such amazing smelling (and looking) fruit hadn’t been plucked from all the trees. Our host told us that the oranges were actually bitter tasting, but people drink lemonade don’t they? We made sure to have our full share of oranges and they tasted sweet. With the sun shining radiantly, the trees overbearing with fruit and my allergies flaring we felt Spring in full swing on the streets of Spain. Have you been to Spain? What spots would you add or recommend?